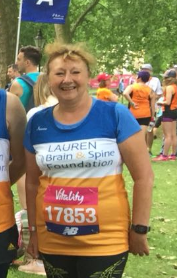 Our Community Ambassadors are 10 volunteers who represent the Brain & Spine Foundation in their local communities across the UK. 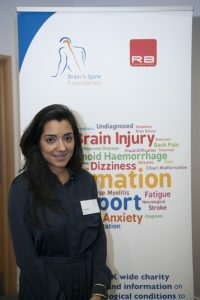 They are dedicated to helping us achieve our mission to improve understanding and awareness of neurological problems, raise the profile of the charity to enable more people to access support, and encourage fundraising activities in their local community. Scroll down to read all of their inspiring stories! In the many years that Lauren Downie has been affiliated with the Brain & Spine Foundation, she has worked tirelessly to raise awareness of neurological conditions and has become an indispensable supporter. Through gaining media coverage and taking part in countless fundraising events, Lauren has increased our charity’s profile and raised over £10,000 in funding for our cause. Lauren first came into contact with the Brain & Spine Foundation after suffering a subarachnoid haemorrhage in 2004. Her consultant provided her with a booklet of ours and she went on to contact our helpline for further information. At last I was speaking to someone who understood SAH. Whilst my GP was very kind, understanding and supportive, due to lack of specialist training, few GPs really understand the long-term impact of SAH. The Brain & Spine Foundation was my only point of contact with specialist nurses who told me what to expect. It’s my goal to raise awareness of the charity’s work and about the lack of local community support for people who have suffered a subarachnoid haemorrhage, as well as those with other neurological conditions. I really hope that in some small way I can help to bring about change to improve local services. In 2015 Lauren received a first class honours degree in Health & Social Care, basing her final project on recovery from SAH. Lauren retired from the NHS in 2016 and has since been working in the field of education and training delivery. She feels there is a great need for better education amongst medical professionals regarding neurological conditions, including diagnosis, treatment and the long term implications. In March 2015 I was taken into A&E suffering a life threatening illness which could have had a very different outcome to where I am today. At the age of 38 I had a subarachnoid haemorrhage (SAH). I have used my experience to be able to influence others by raising awareness of SAH, and turning a negative experience into a positive one, as I understand that I am a very lucky individual to have survived with no long-term serious effects. It has given me a purpose to take charge of who I am and what I want to do with my life. I have created video blogs to give an understanding and explain the severity of a brain haemorrhage, and how this affects friends and family, not just the individual that has suffered. I have done talks on radio, at schools and at the Royal College of Surgeons in London to share my experiences. Also to give hope and not 'give up'. I’m currently Vice President of a multi-national organisation and also now proud to be Ambassador for the Brain & Spine Foundation. 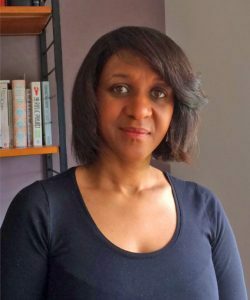 I write a monthly Blog to share different experiences of my life which is shared by a community website ‘The Garden Hale’. I’m active on Facebook, Twitter and Instagram and regularly post motivating images and information. The annual Clacton Triathlon Weekend was born in 1999, and I have been a member of the organising team of five from the beginning. It is of a high standard and dedicated to raise funds for the Brain & Spine Foundation for two reasons – a quadriplegic friend. and a fatal subarachnoid haemorrhage friend. Over those years our donations have raised over £80,000; in 2015 I box- collected £501.90 at the exit gates! We began with 25 competitors and now have over 400 each September when the tides are ready for the swims, and to date we have 159 entries. The meaning of Community Ambassador is ‘official messenger’, and I will do my best to carry that responsibility to whomsoever I meet. My name is Carolyn Turner and I live in Leicester. I first contacted the Brain & Spine Foundation back in October 2013 following surgery for a spinal tumour. After I was discharged from hospital I felt very much on my own. I didn't know anyone else who had had a spinal tumour and there was no one to talk to regarding my ongoing symptoms. I came across the BSF by chance as I trialled through the Internet and spoke to the neuro oncology nurses who were really helpful. It was really reassuring having someone to speak to that understood how I was feeling and gradually as I began to feel stronger I felt I wanted to actively get involved with fundraising and an awareness campaign. In February 2013 my close friend, Chris ‘Fin’ Findley, was attacked as he was walking home from a night out with friends. Fin was struck from behind, knocked unconscious and sustained life threatening brain injuries. He was placed in a medically induced coma and later underwent brain surgery but died ten days later of the injuries sustained. Fin was a serving Police Officer and only 33 years old. He was unique, charismatic, the life and soul of any event and was loved by many. After a lengthy trial the person who inflicted Fin’s injuries received three years in custody for the Manslaughter of Fin. 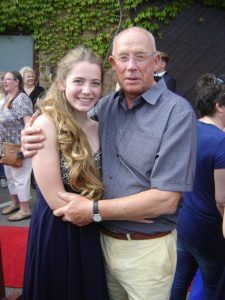 A plaque on a bench did not seem befitting of Fin, so I started Finfest a small festival whose sole aim is to get all of his loved ones together to have a good time and raise money to help people affected by injuries such as Fin sustained. I had zero experience of organising events prior to my first one but took the plunge and I am now a fully fledged festival organiser!! Don't be scared of aiming high, I was amazed by how many people will help you once you take the first steps! I chose the Brain & Spine Foundation as the festival's charity of choice and we now proudly donate all of our profits from Finfest to BSF. 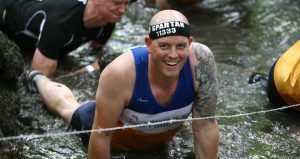 My family have also got in on the action, my sister Sarah Anderson and my wife Rachel Hensley have completed the Royal Parks Half Marathon and the London Marathon for the Brain & Spine Foundation, I have completed a Spartan Race and we have held three 'Finfests' and two standalone concerts to raise money for the Foundation. To date we have collectively raised over £7,200. I am also a cluster headache sufferer so I have firsthand experience of how neurological conditions can have an impact on individuals and their families. The Brain & Spine Foundation are an awesome charity, who is most worthy of your support. I am proud to be a Community Ambassador for the Brain & Spine Foundation. 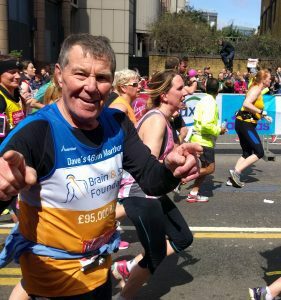 I first heard about the Brain & Spine Foundation from my Dad, Norman Tovey, who was part of the Foundation’s 2004 London Marathon Team, when he was 80 years young! He had previously received help from the Brain & Spine Foundation earlier in his life. He was a very keen sportsman, playing rugby for the mighty Harlequins, and organised half marathons at Cobham Hall where he taught Physics. He always helped and encouraged all his 8 grandchildren in everything that they did. I ran the London Marathon with my daughter Emma last year (2015) in his memory and to raise money for the Foundation. This year we went to London with my family to support the runners - well done to all who ran this year! We have held other fundraising events including selling Christmas cards designed by my wife Lynne's dad, a golf day at RedLibetts Golf Club, quiz night, table tennis tournament and my sister Liz kindly opened her house and organised a vintage tea party afternoon. We have a few more fundraising events planned this year, including publicity at my sister Liz’s new book launch and an art show. Thanks to all my family and friends for the help they have given in supporting the Foundation over the years and to all at the Foundation who do such a great job. So many people are disabled by neurological conditions, such as multiple sclerosis, strokes or brain tumours. More people die from brain and spine conditions than from heart disease or cancer. There are also only a handful of specialists and so many of those affected never see one; tragic when we know specialist care can reduce death and disability by up to 30%. Despite this, neurological services receive less funding than other major causes of death and disability. I look forward to continuing to support the foundation, which will remain close to my heart. On the 3rd September 1995 my 10 year old daughter Lizzie and my husband Charlie and our dog Boots were in a car accident near Bala, North Wales. Lizzie had suffered a severe percussive head injury, broken pelvis and a broken ankle; Charlie had suffered a fractured skull. Lizzie’s condition deteriorated and she was transferred for surgery to Walton Neurology Unit in Liverpool. Over the next few days Lizzie fought for life in Walton as her brain swelled. She survived the immediate crisis but remained ventilated and in a coma for weeks. By mid-October she was transferred, still very unresponsive, but off the ventilator, for further treatment to Alder Hey Children’s Hospital. She was discharged in a wheelchair in mid-December. We were lucky that Lizzie received such a high level of specialist care and I remain convinced that had she not received it the outcome might have been very different. Lizzie has gone on to further education and is now in full time employment. Charlie was discharged from hospital a few weeks after the accident. He was very disorientated and agitated and sadly he was pretty much left to cope alone with his injury as he was drawn into helping with Lizzie’s care as she was so very ill. Looking back I realise that the two of them had very different levels of support and care and it must have been very difficult and frightening for Charlie. The accident changed our lives and we live with the consequences daily but we also know things could have been a great deal worse and for many people it is. Neurological services are patchy and knowledge can be hard to come by and that is why we feel that what the Brain & Spine Foundation does is so important. The first Marathon that Charlie ran for the charity in 2001 was as much for the fundraising as for Charlie to feel that he was doing something positive after his accident, but the people we met and the vision that the Brain & Spine Foundation had inspired us. It has been a privilege to be part of their mission over the last 15 years, and to support the services it offers to people who have gone through brain or spine injuries or illnesses and to the families and friends of the patients – it’s invaluable. It can happen to anyone and the effects can be devastating. I feel it is essential the Brain & Spine Foundation receive more coverage and recognition. By being Ambassadors we hope to raise the profile of the charity throughout the country for the work they put in. Charlie and I have now completed all 6 major world marathons (London, New York, Tokyo, Boston, Berlin and Chicago) together and are in the process of finding out if we are the only married couple ever to have done so! So far, we have raised over £25,000 for the Brain & Spine Foundation. Back in late 2001 I saw an advert in the Daily Telegraph asking people who were running in the 2002 London Marathon if they wanted to run for the Brain & Spine Foundation. Well, probably like most others who saw it, I wondered who and what is this charity? Anyway I called the number and spoke to the then Head of Fundraising, who told me all about the Brain & Spine Foundation and so with a bit of persuasion I decided to give it a go. Now 16 years later at the age of 72 I ran the 2016 London Marathon for the 16th consecutive year for the Brain & Spine Foundation. This was my 465th full marathon and I raised, along with my 5 strong “Team Phillips” (now an annual feature in #TeamBrainandSpine) £12,000. So my total raised is now £97,000 towards my goal of £100,000 for the charity. From the start in 2002 I have realised the fantastic and super work this small charity does for sufferers of neurological conditions, which I hope I never encounter, or anyone else for that matter. Yet what I do know is that all sufferers who use the charity's services are in extremely good hands and won't get better help anywhere else. 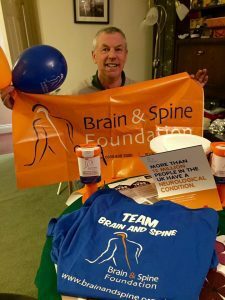 Accordingly the Brain & Spine Foundation has become part of my daily existence and the office window of my accountancy business in Kenilworth is plastered with their posters and leaflets to the extent that people passing by and clients often pop in and donate to the Collection Box inside. Fortunately none of my close family or friends suffers from a neurological condition, but should it happen we know where the best support and advice will come from. In my case, my daughter Anna who ran with me in the 2004 London Marathon, when Gabby and Kenny Logan were captains, claims that I’m already beyond the help of anyone as I can’t have a “brain” if my goal is to run 500 marathons! She should know as she is a Physiotherapist at Warwick Hospital. Well we’ll see, but as long as I am able I’ll remain a “fixture and fitting” of the Brain & Spine Foundation and do all I can for this fabulous, friendly and truly lovable charity. I am truly honoured to be a Community Ambassador for this fantastic charity. 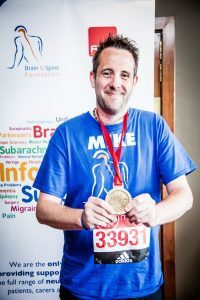 I first encountered the Brain & Spine Foundation in 2014 through an appeal to represent them in the 2015 London Marathon. From first contact with the team I immediately felt the welcoming and supportive stance of everyone involved. 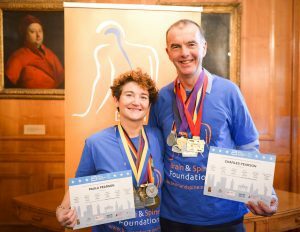 I have just completed my second marathon for them and fully intend to tackle a third in 2017… if you are thinking of running, why not get in touch and support the Brain & Spine Foundation? I have been really fortunate in my life to have not had any direct effect from any of the conditions that the Brain & Spine Foundation support, but I have seen others affected. I am a Primary School Teacher and have taught several children suffering from such conditions and witnessed the bravery of those involved and their families. Charities such as the Brain & Spine Foundation provide unbelievable support to these people and make such an incredible difference. I live in Lytham St Annes near Blackpool in Lancashire and am thrilled to be able to continue working with such a dedicated charity. If you would like to get in touch with any of the Community Ambassadors above or would like to know more about this project, please do contact us!